Congrats to the Winter There Games Winning Teams! What an amazing Winter There Games season we’ve had over the past ten days! With almost 300 events and nearly 6,000 competitors, this has been one of the most action packed There Games. We wanted to say thank you to the WTG coordinators, event hosts, co-hosts and all of the color team participants. Congratulations to Purple for a job well done and taking home the Gold this year. It was a close competition for the Blue and Peach teams with Blue taking home the Silver medal and Peach taking the Bronze. Please join us this evening for the Closing Ceremony at 6:00 PM PST/9:00 PM EST at the Winter There Games Village. We will be celebrating the victory of the top three teams and good sportsmanship among all of the competitors during the Games. FrostBite is a Big Hit at the 2015 WTGs! Get your hands on everyone’s new best little buddy in There! Tote around the adorable 2015 WTG penguin mascot doll, FrostBite to all of your scheduled Game events. There is also a fun and festive 2-D Cutout of him available to decorate your home or Clubhouse with during the Winter Games. Winter There Games Start This Week! Get your game face on because the 2015 Winter There Games kick off at the end of this week! The sixteen teams are getting hyped for the Winter Games to begin. There has been a lot of activity lately in the Winter There Games Village and the different color teams have been having team meet ups at the name tag color hangouts. The Village is buzzing awaiting the start of a 10-day series of spectacular There Games events! 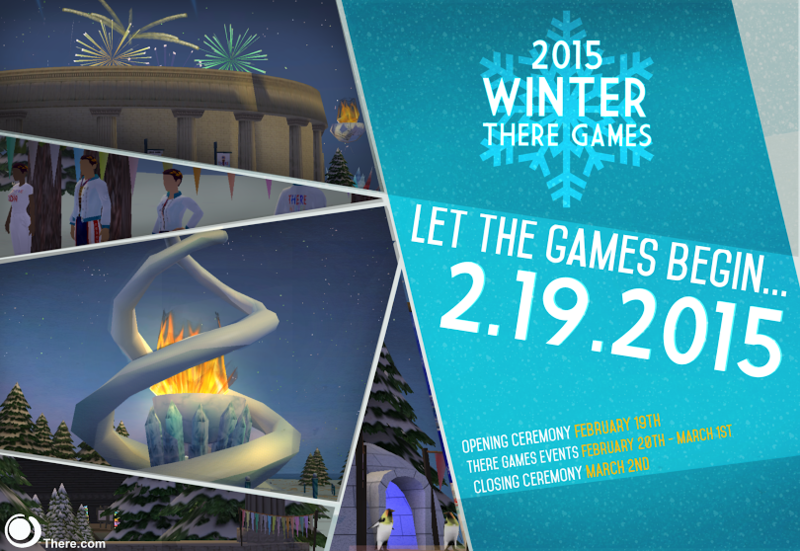 Please join us for the 2015 Winter There Games Opening Ceremony Event on Thursday, February 19th! The Ceremony will be held in the Winter There Games Village starting at 6:00 PM PST/9:00 PM EST. The Opening Ceremony will begin with a couple of speeches from the community followed by the running of the torches and lighting of the flame. There will be a special flyover formation by the Harrier Jet Flight Team at the end of the Opening Ceremony followed by a night of entertainment and dancing hosted by Club99. Head West of the Winter There Games Village to the Club99 PAZ WTG 2015 to continue the celebration. How do I know which team I’m on? Everyone is invited to play and is already part of a team. The color of your name tag determines which team you are on. There are sixteen name tag colors. There is a handy name tag sign set out at the Winter Games Welcome Center. Click on the name tag sign and your avatar will type the name of your color team. Once you know which team you’re on, join your name tag color Club to stay in touch with fellow teammates. It’s fun and easy to participate in Winter There Games events. Click here to see a handy list of the official There Games events. Start signing up now for the events that look appealing to you. There are plenty of fun activities from low-key social gatherings to extreme racing and paintball. How do I keep track of the daily scores? 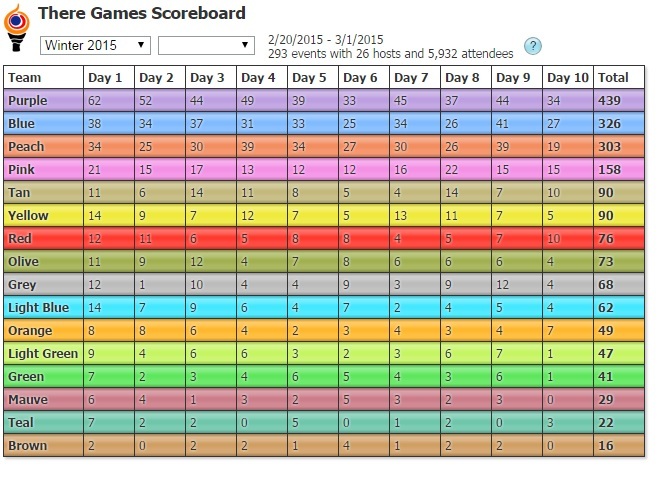 Thanks to the handy Official There Games Scoreboard you can keep an eye on the daily totals and find out which team is in the lead. The Scoreboard also makes it easy to find and sign up for events listed for each individual day. Have a question or want to know more about the upcoming Winter There Games events? Check out our helpful Frequently Asked Questions. Compete in the 2015 Winter There Games events in style with an official shirt or jacket! Now available for purchase in the Auctions. All proceeds go towards supporting Winter There Games events. The official 2015 WTG apparel will only be available for a limited time, so get yours before the season ends. Best of luck to all of the teams. We’ll see you at the Winter There Games!